The State Farm Building Building at 2001 South First Street, Champaign, is a 64,483 square foot facility opened in 2004. It is a multi-tenant building offering top quality office and laboratory space. 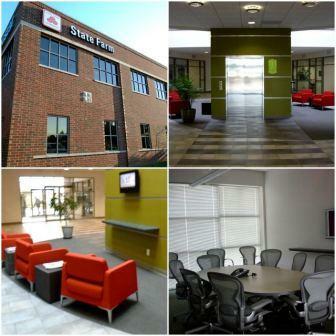 Its upscale interior and exterior finishes, selection of single flex-office rentals, common area amenities including a conference room and lounge areas, and the adjacent pond, make it a popular choice in the park. Data and telecom services are provided by University of Illinois CITES; a PassPoint security system is also installed in the building. Information on space available within this building can be provided by Andrea Ruedi of Fox Development Corporation, 217-239-7514.